Have you recently been traveling or will you be traveling over the next month? Do you love collecting postcards from the places you travel? If so, this is the swap for you! This will be a fairly long swap: sign up before May 15th, mail your postcard before May 31st. We each have just two partners to whom we will send each one postcard from a recent travel destination. Send the postcard naked (i.e. NOT in an envelope) and write a message about your travels. 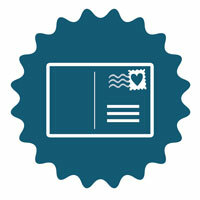 The postcards are sender's choice, but should be store bought from your travel destination. You do not necessarily have to mail your postcard FROM your travel destination, but definitely can. Write a little message about something you enjoyed from your trip on the postcard. All are welcome to join this international swap - including new users - but I reserve the right to remove questionable users. @Momskii - I'll try to host a second version of this swap for summer travels! We have a really stellar group of swappers in this international swap! Thank you all for joining. Happy postcard mailing! Postcards were sent out today from the post office in my vacation spot! :) Enjoy! I did send my postcards on the 31st but didn't get back to the computer to mark it sent that day.